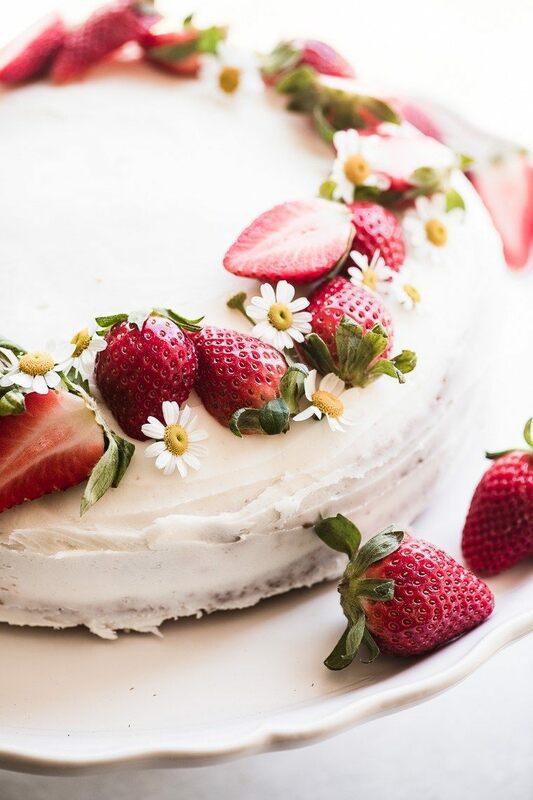 This cake has been super popular on the blog, and it’s one of those uber simple but versatile recipes that can go from breakfast and brunch to dessert. Lightly butter and flour two 9 inch cake pans and set aside. Whisk together the cake mix, eggs, oil, and extract until well mixed and there are no large lumps. Small lumps are ok. Divide evenly into the two prepared cake pans and bake according to your cake mix instructions. For me it was about 23 minutes. The cake should be risen and not wobbly or wet looking in the middle. Cool for 15 minutes before removing cakes from the pans. Let cool completely before frosting. To make the frosting beat the soft butter with the sugar, extract, and the cream until it becomes smooth and spreadable. Add more cream to loosen it, or more sugar to firm it up. Place one layer of the cooled cake, flat side up, on a platter. Spread the top evenly with the jam. Place the second layer on top of the jam. Frost the top of the cake generously, and then skim coat the sides of the cake to give it a 'naked cake ' look. Alternatively you can completely frost the sides, it's up to you. Platce the berries around the outer edge of the top of the cake, in a wreath-like pattern. If you're using blossoms, add them as well. Note: I like to add the fruit and flowers shortly before serving.